N.B. Since I know so little about Helene’s life, I have gleaned a lot of information about the world of the theater in which she lived from Gavin Lamber’s Nazimova; A Biography. NewYork: Knopf.1997. I had saved the review from the NYT in April of 1997 and read the book in the summer of 2007. Also around this time, I read Memories by Ethel Barrymore published in 1956 by Hulton Press Limited, London. The Barrymore book especially, easily conjured up the theatrical atmosphere which always surround my grandfather’s younger sister. April 14, Helene’s furture husband, John P., was born in Queens to Thomas F and Mary Welsh. He was their sixth child. Eleanor Duce, a famous Italian actress, came to the USA and did a triumphant tour. Grover Cleveland and his wife came to every performance. Mrs. Cleveland shocked the Washington society by having a tea at the While House in her honor. It was the first tea for an actress. Eleanor Duce was a rival of Sarah Bernhardt. Bernhardt was outgoing thriving on publicity. Duce was the opposite. What did young Helene, most likely already at age ten interested in acting think of these women? They were after all the “movie stars” of the day! May 14 Nazimova signed a contract with Lee Shubert. he engaged an English teacher. Helene Gretsch played in Clyde Finch’s drama “Nathan Hale” a production of the Derrick Dramatic Club of Erasmus High School. Helene played Dinah. November 12 Alla Nazimova made her first appearance on Broadway in Ibsen’s “Hedda Gabler” at the Princess Theater. The young Eugene O’Neil who was to become the first major American playwrite saw Nazimova’s performance ten times. “All these stars were personalities first and actresses second” Gavin Lambert, NAZIMOVA. “Cosmopolitan” ran a special feature on Nazimova. Dissenter was William Winter, who launched an attack against Ibsen as a threat to American values. continued to play to a packed house for two months. April 12 Nazimova plays “Comtesse Coquette” a comedy….the house was packed for every performance until the end of June when the theater season ended. Helene Gretsch graduates from Erasmus High School. Commencement held at Majestic Theater. Helene’s mother is married to David Kling. This certificate was given to Gretchen Elsner-Sommer by Elsa’s grandchildren after their father’s, Teddy Clauss’ death. A similar certificate, also for 42 shares was given to Elsa Clauss on December 21, 1912, see 1912 below. 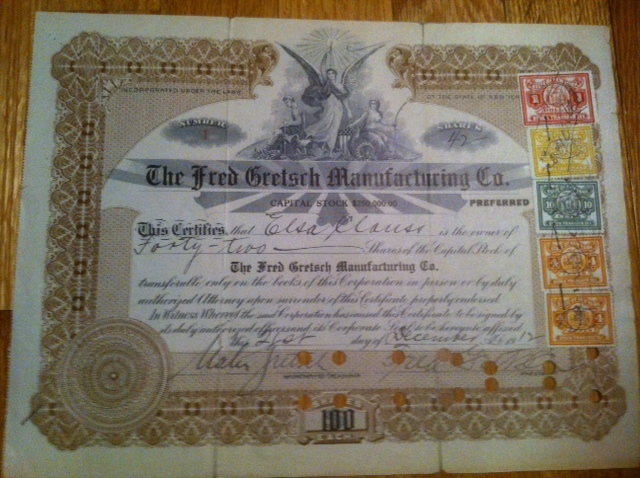 Helene’s sister, Elsa Gretsch received a certificate for 42 shares of the Fred Gretsch Mfg, Co., signed by her older brothers Fred, President, and Walter, Treasurer. Each share was worth $100.00. Perhaps, an equal amount was given to each of the Gretsch girls. Perhaps, that is why Helene felt comfortable applying for admission to Emerson College the next month. Helene Gretsch applies for admission to Emerson College of Oratory in Boston. Many thanks to Christina J. Zamon, the head archivist at Emerson College for providing this information on March 5, 2013. Name in full : Helene Gretsch. Residence while at Emerson College: (147 is crossed out) 39 St Stephens St.
Name and address of Father, Mother or guardian: Morris Mac Donald, 136 Broadway, Nassau Trust Building, Brooklyn. It is interesting to note that Helene gives this 496 Hancock Street address. It is not the address of her mother either before or after Rosa’s marriage to David Kling. Helene is not living with her mother. Nor does Helene list her mother as her guardian rather she lists Morris MacDonald. Morris MacDonald is a lawyer with whom Helene must be well acquainted. In the near future she will be connected with him on many happenings. On September 27, 1909, Helene and Morris and Louis Gretsch incorporated the Fulton Land and Mortgage Co in Brooklyn. Helene, Morris and Louis were listed as partners. Again, on January 4, 1911, Helene, Morris, Louis and Elsa Gretsch Clauss came together to sign more papers for the Fulton Land & Mortgage Co.
Again in 1915, Helene would call on Morris MacDonald to represent her in court during the David Hyman case. Helene was on tour with a play. Opened in Washington and sold out for three weeks. New Orleans to Toronto, a highly successful six month tour. a merry gathering of young folks surprised Louis Gretsch on his birthday last Saturday evening at his home, 45 Waterbury Ave, Richmond Hill. Miss Helene Hope and Edward Braendli entertained the guests in sketch entitled ” A Happy Pair”. This was followed by a musical entertainment. Foremost among the singers was William C. Pengal of Day Ridge, who rendered several selections from the “Bohemian Girl”. An elaborate collation was then served in the dinning room wish was artistically decorated. Morris V. McDonald, who acted as toastmaster called upon all men present. Each responded with clever or humorous speeches. Helene’s older sister Elsa (age 23), married Joseph L. Clauss (age 32) in Richmond Hill, Queens, New York. At the time of her wedding, Elsa Gretsch was living at 285 Kingston Ave, Brooklyn. This is where Elsa’s older brother Fred and his wife Charlotte Sommer Gretsch lived with their three sons, Fred, William and Richard. Helene and her brother Louis Gretsch are witnesses to the wedding of their sister, Elsa. The pastor of St. John’s Ev. Lutheran Church officiated. Apparently, Joseph Clauss was from a very Catholic family and his mother did not approve of the marriage. As a result the children born of this marriage Teddy Clauss and his younger brother Joe, were not very close at all to their father’s mother. Ted Clauss also told me that his father, Joseph Clauss was working with Louis Gretsch at a bank. One night, Louie Gretsch brought his friend joe Clauss home for dinner. Louie pointed to his three sisters, Elsa, Helene and Hertha and said to Joe, ” Pick one!” Joe picked Elsa. Miss Elsa Gretsch, daughter of Mrs. Rosa Kling was married to Mr. Joseph Theodore Clauss at home of the bride’s mother 43 Waterbury Ave, Richmond Hill, LI on Wednesday evening, June 2, the Rev. Doctor Benner officiating. It was a quiet home wedding, only the immediate family and a small circle of intimate friends being present. The parlors were beautifully decorated with palms and cut flowers, the ceremony being performed under a bower of hydrangeas and apple blossoms. The bride wore an elaborate gown of white satin trimmed with duchess lace, and pearls ornaments. She carried a shower bouquet of lilies of the valley. The groom’s gift was a handsome necklace, set with diamonds. She was given away byre eldest brother, Frederick Gretsch, Brooklyn, and was attended by her sister, Miss Helen Gretsch, as bridesmaid who was attired in a grown of pink crepe meteor, trimmed with Irish lace and carried a bouquet of white roses. Louis Gretsch acted as best man. After the ceremony an elaborate supper was served, and the young couple left for an extended trip through Canada and the Northwest. They will be at home to their friends after August 1, at 852 Classon. The bride was the recipient of many handsome gifts including solid silver and cut glass. Among those present were: Mr. and Mrs. Howe, Mr. and Mrs. Weynness, Mr. and Mrs. M.C. McDonald, the Reverend Doctor Benner, Mr. and Mrs. D. Kling, Mr and Mrs. Fred Gretsch, Mr and Mrs. Charles Bell, Mr and Mrs. Kating, Mrs. Emily Gretsch, Clara Gretsch, Mr and Mrs. Ralph Gretsch, the Misses Helen Lewin, Margaret Flannery, Florence Brand, Enid Brand, and William McLaidy, Louis Gretsch, MR. and Mrs. William Sommer, Joseph W. Genner, Clara Gretsch, Olga Gretsch, Minnie Gretsch, Mrs. W. Lankonw, Helen Gretsch, Bertha Gretsch, Herbert Gretsch and Walter Gretsch. Eleonora Duse retires from the theater. Note that Louis Gretsch is the older brother of Helene and that Morris Mc.Donald will in the near future handle the Gretsch girls claim to the will of Jacob Hyman. See below, February 20, 1915. Helene Gretsch gives a performance under her stage name Helene Hope. She appeared in “A House Builded on the Sands” a three act drama by Emilie Fabre’s translated from the French. This was the first time that this piece played in this country. It was part of a matinee performance at the Empire theatre by the students of the Academy of the Dramatic Arts. An article in the New York Times reports on the above mentioned matinee. As of 2013, this is the only recorded reference I have of Helene’s stage career. Helene Gretsch, graduates from The American Academy of Dramatic Arts. Helene Hope of Brooklyn is listed as one of the graduates. Ted Clauss wrote further of Helen’s work ” Aunt Helen’s first work in the theater was secured for her through the Academy, and she had small parts in plays with Dewolfe Hopper. Later, she toured in straight with Sidney Drew, in light comedy, and also with John Drew, in the heavy stuff. She did no musicals. During the years she did several short plays with William Farnaum, (Farnum) one of which I saw at the Flatbush Theater ( 2207 Church Street ) in 1918, and can still remember it. She had a regular agent, who shipped her on tours all over the U.S. and Canada. She used the stage name Helene Hope . She also toured with Otis Skinner of theatre fame and knew Cornelia Otis Skinner the monologist”. April 18 “Little Eyolf” American premier of another Ibsen play. Played to capacity houses for three months. 75,000 people saw it. at the 39th street theater which was to be renamed “Nazimova’s 39th street theater”. Frohman, the first and most successful star makers among American producers, had a star list that included John Drew, Ethel Barrymore, Maude Adams, Billie Burke, Marie Doro, and William (sherlock Holmes) Gillette. Nazimova wanted to open with “Witness for the Defense” but Ethel Barrymore got the part and only lasted 6 weeks at the Empire. September 15 Nazimova opened in Utica with ” The Other Mary” and closed in Chicago three weeks later. December 14 “The Mrionettes” opened at the Lyceum. This very colorful certificate was first given to Helene’s older sister, Elsa Clauss, on December 21, 1912. 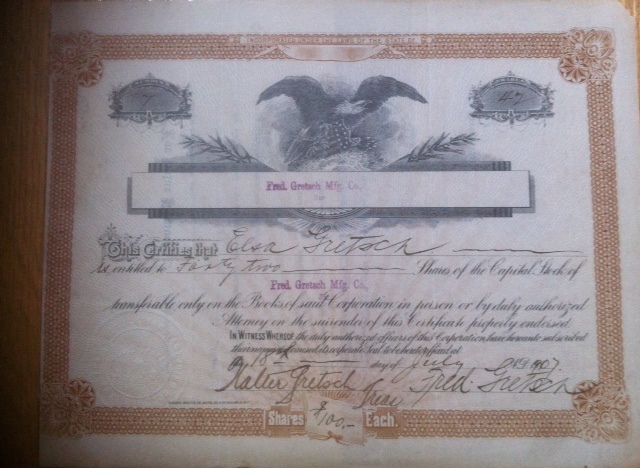 It was for 42 shares of the Fred Gretsch Manufacturing Co. Each share was worth $100.00 and the certificate by signed by Elsa’s older brothers, Fred and Walter. Perhaps, stock was given at the same time to all the Gretsch sisters, Elsa, Helene and Hertha. NOte the very colorful transfer stamps on the right hand side. This certificate was given to Gretchen Elsner-Sommer after the death of Elsa’s son, Teddy Clauss, by her grandchildren. Jacob Hyman, a long time boarder with the Gretsch family died. His death set in motion a series of court actions which leave us a few clues to Helene’s acting life. Helene was with a touring group in the county of Hamilton, Ohio. She petitionted the court that K.C. & M.V. Mc Donal at 189 Montague Street in Brooklyn appear for her in the up coming proceedings concerning the will of Jacob Hyman. Miss Hazel King, daughter of Mrs. J.F.H. King entertained a number of friends, at her home, 71 Midwood street, on Tuesday evening. An interesting musical program was enjoyed and dancing followed. The program consisted of songs given by Miss Hazel King, W. Russell, Miss Laura Gilder, Albert Salmon, Willard Salmon, Harry Bennett: and piano selections by Robert MacMillan, and Miss Grace Gilder. Those present were Miss Marjorie Bruce. J.F.H. King, Bertell A King, Miss Marjorie Nelson, Miss May Brown, Miss May Russell, Miss Hertha Gretsch, Herbert Gretsch, Joseph Tuggle, Charles Rice , Mr. Williams and Theo Schutltze-Berge. The family story goes that Helene Gretsch married Jack Welsh secretly before he went to war. This secretcy made it possible for Helene to go on acting while he was away. No record of the marriage has been found. John P Welsh registered for the draft on May 17, 1917. He stated he was single and born in 1892. This date makes him 3 years older than he actually was. April 9 Sidney Drew who Helene had toured with died. He had a son, S Rankin Drew, who died in World War I. It is interesting to speculate how well Helene Hope knew Sidney Drew and how the war impacted them both. Sidney was the uncle of Ethel, John, Lionel Barrymore. It is believed that he was his mother’e Louisa Drew’s biological child although she said that she adopted him after her husband died. According to US Census, dated January 4, 1920, Helene and John Welsh are living with the Gretsch/ Kling family at 42 Sidney Place, Brooklyn. Walter Gretsch< Helen’s older brother, and Gertrude Beardall Gourlay are married and leave shortly there after for Europe. September, Walter visits with William Gretsch and helps William move from Heidelberg to Basel. William’s property is released from the Alien Property Custodian. There must have been talk in the family of money coming to the family from this release. Walter was probably sent to check it out. Walter showed a telegram detailing this property release to the American Consul in Basel. That consul recorded this telegram in his notes on William Gretsch’s passport application from 1920. February 12 ” A Doll’s House” a film financed by Nazimova opened in New York, “restored Nazimova’s prestige as an actress”. Lambert…a box office failure. in spite of this commercial failure, she invested $250,000. on a second independant project…ended up spending $400,000 by the time Allied put Salone on the shelf in June of 1922. July 30 Eleonora Duse’s picture appears on the cover of Time Magazine, the first woman ever. April 21 Eleonora Duse dies in Pittsburg. It is the last stop of her American Tour. August 30 arrived back in New York. From the 1920 census, Dr. Saybolt is living with his wife Angela and three children on at 11 Greenway Terrace South. He was in private medical practice. Dr. Saybolt was 40 years old, the same age as Charlotte and Fred. The Saybolt family home was less than a mile away from Bill’s home. It was located near the Forest Hills Inn. PErhaps, he was Bill’s physician. J.P. Welch ( Welsh) was the wife of Helen Gretsch Welsh and an uncle of Bill Gretsch. Bill must have been close to Uncle Jack to have written his name here. Years later, Helen Gretsch Welsh, my great aunt, told me how she used to visit my father often when he was a child and confined to bed because of his many polio operations. Perhaps, Uncle Jack also visited often. February 23 Nazimova opened in her second play at the Civic but neither critics nor audiences shared her admiration for Katrina. Helene and her husband Jack Welsh return to New York via the ‘Homeric” liner. Her husband’s birthday is listed as 1895. He is now giving his real age. Helene gives her year of birth as 1897. She was actually born ten years earlier in 1887. According to the US Census in 1930, Helene Welsh and her husband, John P., are living in a rented house at 237 Greenway North in Forest Hills. Also living with them is a servant Lena Sandmeyer, age 23, who was from Germany. the house was not far away from Helene’s mother’s house on Union Turnpike and her brother’s house on Shorthill Road. John was listed as a contractor/ paving streets. Rosa, Helene’s mother died in December. In the invantory of her estate, Helene is listed as living at 237 Greenway North. January 18, Helene’s younger sister Hertha dies. Helene is listed as the executrix of her estate. Helene’s address is given as 37 Shorthill Road. For this distance, it looks like Helene waited until her mother died before she left her husband John. Helene lived at Shorthill Road with her brother until his sudden death in 1952. “John P. Welsh, a Long Island City contractor and a World War veteran, died at his home, 84-13 Queens Boulevard, Elmhurst, late Wednesday after a long illness. His age was 45. Mr. Welsh was a member of the Welsh Brothers Contrasting Company of Long Island City, which was founded by his father, Thomas F. Welsch. He was born in Long Island City and resided in Queens all of his life. During the World War he went overseas as a first lieutenant and was promoted to the rank of captain in the First Division Motor Corps. July 13 Alla Nazimova died. John Beal a friend of her latter years read at her memorial service from the books at her bedside. Spinoza’s ETHICS and MEDITATIONS of Marcus Arelius. John Beal was a friend of my mother, Maxine Elsner Gretsch. They were both from Joplin, Missouri. I wonder if my mother and Helene Welsh discussed that John Beal had been a part of Nazimova’s funeral. After the sudden death of her brother, Fred, Helen had to move out of the her brothers house on Shorthill Road. She had moved into this house after her separation from her husband circa 1935. She was not happy about moving out. It was decided that Sylvia (Maxine) and her children would move into the house. At 37 Shorthill Road, the house my grandfather built and the house where my father and I grew up, I was looking through some stored books in the basement. I was 12. I remember finding a book entitled “Good Night Sweet Prince”. I didn’t know anything about the book but I was mesmorized by its title. Years later, I realized it was a book about the life and times of John Barrymore. 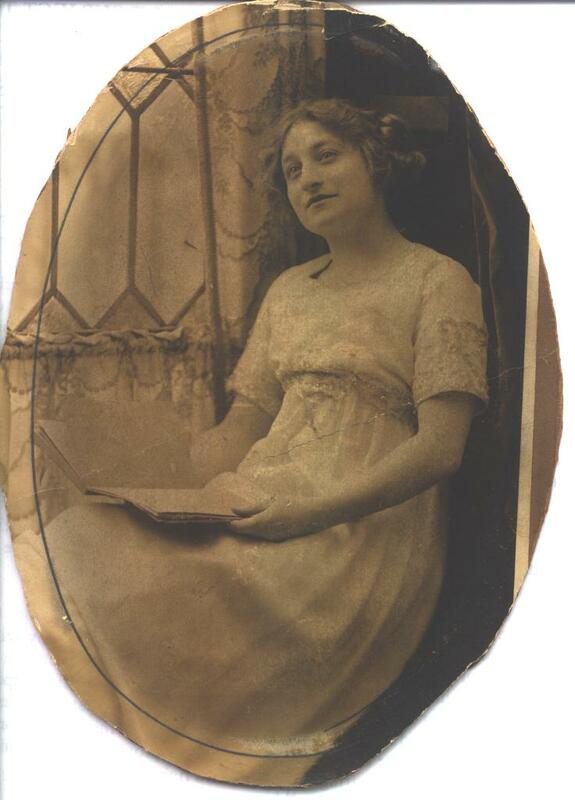 The book must have belonged to my Aunt Helen who lived so long in that house with her widowed brother, my grandfather. At the time, I did not know that Aunt Helen used to live there. Nor did I know that she was once a serious actress. Looking for the book in a used bookstore in early 2000, I can across a book by John Barrymore’s sister Ethel with the enchanging title of Memories. This book reminded me so much of the theatrical aura which always surrounded my aged aunt. Sylvia was recovering from her cancer operation and went to Florida in the winter for a week or two to recover at Helen Welsh’s apartment there. I think Barbara Shea and her young family stayed with me on Shorthill Road while my mother was in Florica with “Aunt Helen”. Helene Welsh came to Shorthill Road to live with Sylvia’s four children after Sylvia’s death. Note that this was the second time that Helene moved into the house on Shorthill Road. She was often intoxicated and ill. It was very scary for me to she her so intoxicated and ill.
Helene Welsh was living in Palm Beach at a hotel. I was pregnant with my first child, Maggie. My husband and I had just moved to Miami and we drove to Palm Beach to visit with Aunt Helen. I remember her room was very messy and there were aunts and other bugs crawling around her night table. She took me into her bed room alone, leaving Richard in another room and asked me about his heritage. She was very concerned that I had not married below my rank. October 18, Helene Welsh died in Palm Beach, Floria.